At Johnson & Johnson, Attorneys At Law, we are a father-daughter team of lawyers that offers friendly and effective family law and estate planning services in Florham Park, New Jersey. While family law and estate planning matters constitute our main focus, we also assist clients with other legal needs, including expungements, real estate and land use issues, veterans rights and civil litigation. Our family law firm has a long history serving the needs of the community in and around Morris County. Our clients tend to be repeat customers, with some families returning for various issues over two and even three generations. 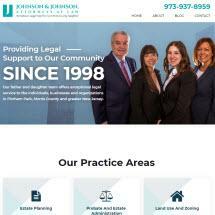 Furthermore, both John and Sharon are Morris County natives: John has been practicing law in New Jersey since 1976 and Sharon since 1995. Our firm has been around since 1998. At Johnson & Johnson, Attorneys-At-Law, we look forward to helping you take control of your legal concerns in New Jersey.